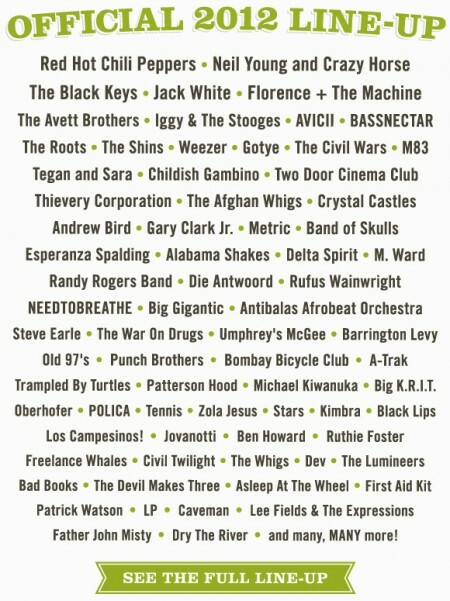 Austin City Limits 2012 Lineup is here!! | Do You Hear The Music? Austin City Limits 2012 Lineup is here!! And at first glance what a great one it is. October 12-14 Zilker Park, Austin, Texas, plan to be there for Austin City Limits. Neil Young and Crazy Horse, Red Hot Chili Peppers, The Black Keys, Jack White, Florence + The Machine, The Avett Brothers, Avicii, Bassnectar, The Rotts and Jack White headline the final festival of the season. Add in acts like Esperanza Spalding, Alabama Shakes, The Lumineers, Michael Kiwanuka, First Aid Kit, Gary Clark Jr, He’s My Brother She’s My Sister, Dry The River, Royal Teeth, Colorfeels and more; WOW!